"Susan G. Komen fought breast cancer with her heart, body and soul. Throughout her diagnosis, treatments, and endless days in the hospital, she spent her time thinking of ways to make life better for other women battling breast cancer instead of worrying about her own situation. 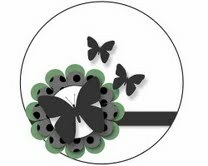 That concern for others continued even as Susan neared the end of her fight. Moved by Susan’s compassion for others and committed to making a difference, Nancy G. Brinker promised her sister that she would do everything in her power to end breast cancer forever." Starting with The Paper Variety's challenge as inspiration for this card, I arranged the three cherry blossom images from TiffanyDoodle's newest release to her series, Granny's Yard, to create my own background paper, used two types of ink to highlight the blossoms and finished the card by one powerful sentiment. Tiffany has tons of specials and even a fun easter egg hunt going on in April (see my side bar) that you won't want to miss out on! 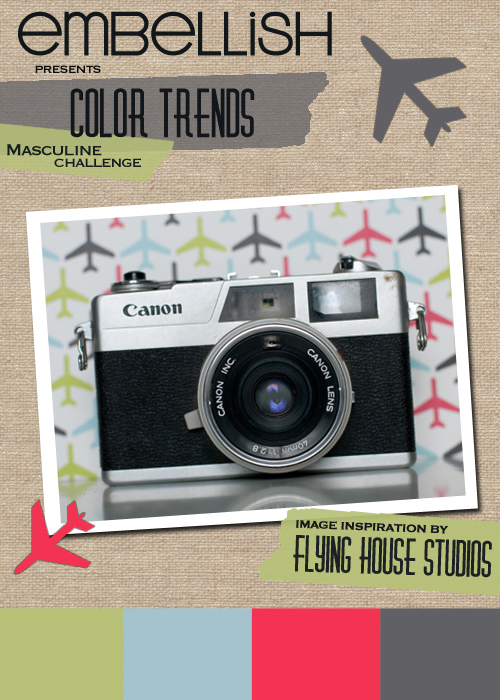 I do believe any sense of normalcy has left my house and taken a vacation... Just a quick post inviting you to play along too with a few of my favorite challenges! 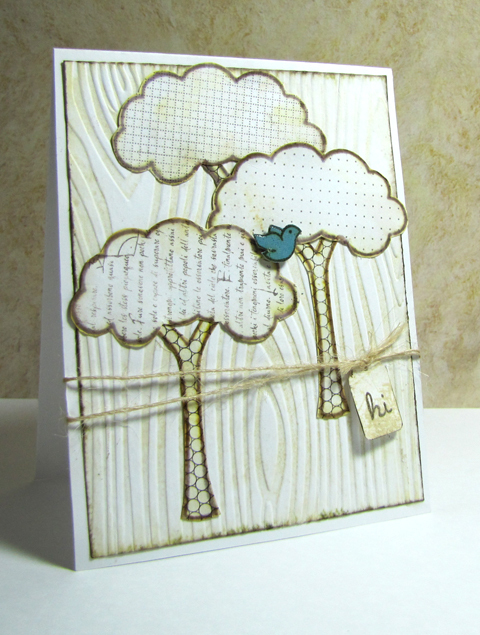 First, this card was inspired by the current sketch and product challenge at Limelight Papercrafts. These sketches are so versatile, as you can see I've taken a bit of liberty with a few placements and scale, but the inspiration is there. Link up your creation, with a birthday theme to the Limelight Blog by Monday for your chance to win a Kaisercraft train album. Additionally, I am playing along with Yvonne's Guest Designer Challenge over on her blog, Do More with Less. 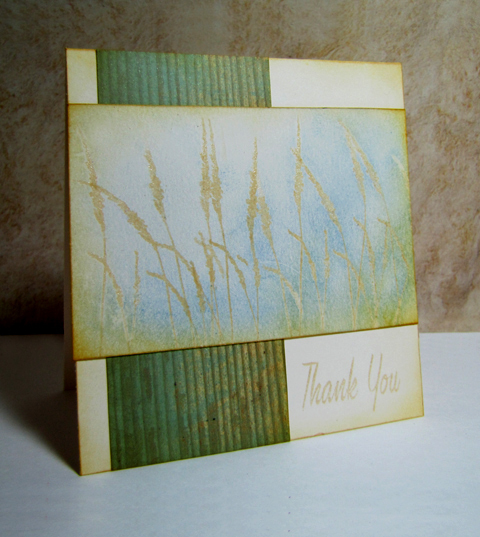 Debbie Standard sure does amazing things with sanded cardstock and I wanted to try my hand at it as well. The woodgrain pattern has been sanded down to a lighter shade, and the texture is kind of fuzzy in person. Love it! 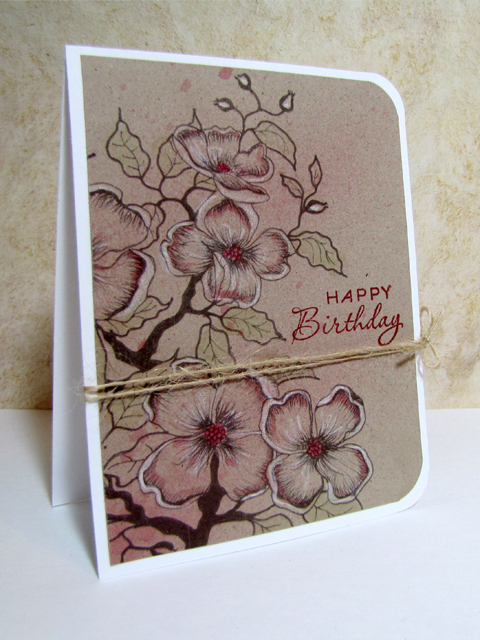 I laughed out loud when my boy said I was "so trendy" with this card...perhaps its the colors, textures, patterns and little metal pearls? I like to think so anyway, but I think he was trying to make me feel good. Life really is all about the little things in life, isn't it? 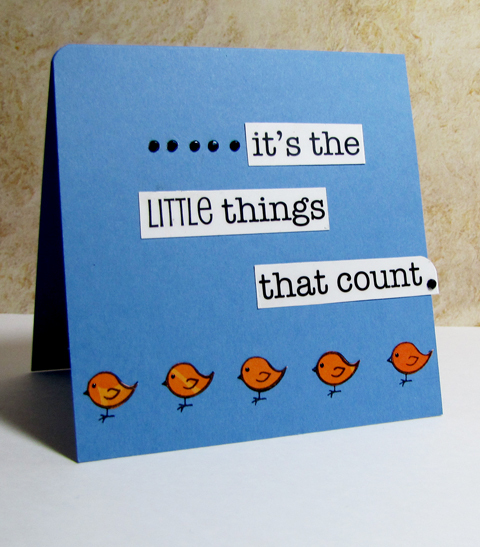 I'm blessed that I've purely run out of fingers and toes when counting all the little blessings in my life. Denami is having a Product Challenge to feature rhinestones. I like to use rhinestones to accentuate a sentiment mostly... 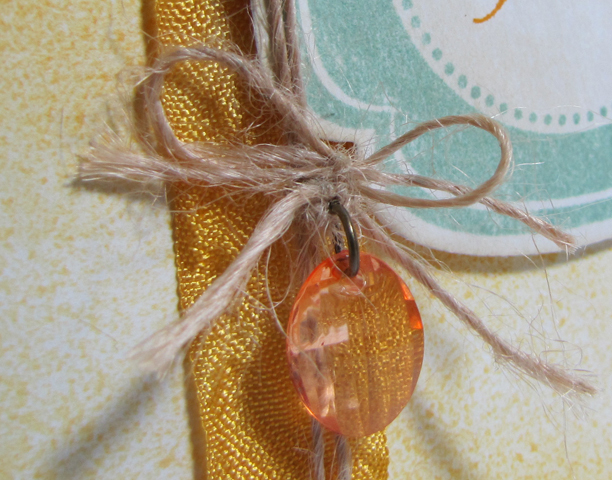 In fact, I think this is the most rhinestones I've ever put on a card before. I remember registering for our wedding with my husband and in order for him to remain remotely interested in towels and cooking supplies, we had to stop by the automotive department. The "combo" package wouldn't do, he had to register for the drill, the sander, the screwdriver set separately. I also recall his statements on how he needed to go to his father's, because his father has everything and can offer a solution to his problem. Of course, we are now older and therefore my car has to fight for room to rest at night. 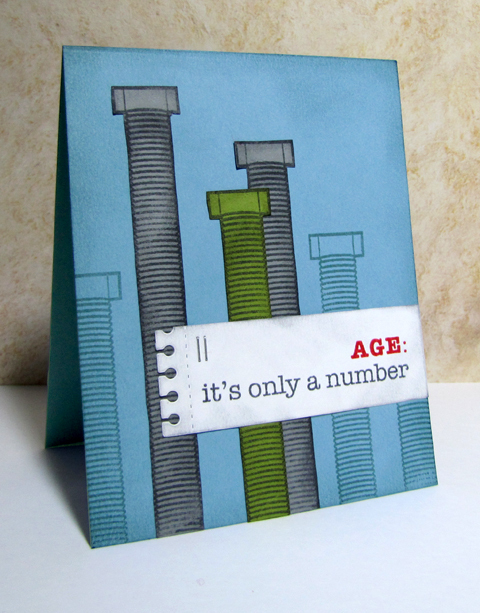 Do you think that men secretly justify their age by the number of tools or supplies that they own in their garage? My car stalled right in the middle of the county highway. After rolling to the side and calling my husband to rescue me, I sat there waiting. And waiting. After a few minutes I noticed a bluebird just sitting there on the telephone wire above me. Watching. And waiting with me. He never flew away, he never seemed to move. He just watched and waited. As soon as my husband rolled up behind me, the hues of blue fly away. I knew in my heart that the bluebird was sent by someone to be my protector those long thirty or so minutes. The Lawnscaping Challenge is all about a splash of color. Having gone through a recent personal rough patch in regards to work, etc., I remembered the power of the bluebird and created this card. Instead of the black tones, I reached for the cream and brown, with a pop of blue. 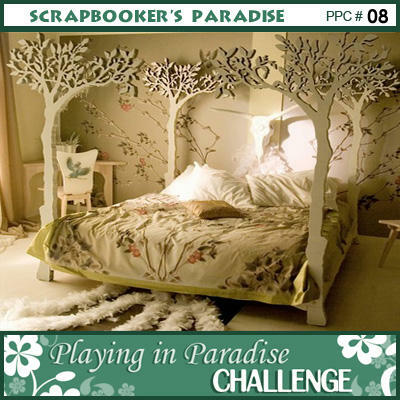 The inspiration for the general design and neutral color theme came from the challenge at Scrapbooker's Paradise. On a side note: I really like that I can use challenges as inspiration points, and appreciate it when they help to recall why I make cards. 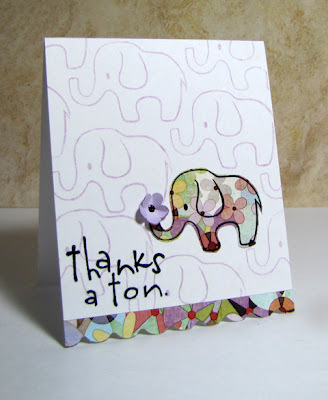 Thank you to all those wonderful crafters who put so much time and talent into running the challenge blogs. I fully intended to make a card with these beautiful images from TiffanyDoodles, but alas, Old Man Winter decided to pay a visit and shut off our power. We had snow coming down like nothing else along with a fantastic (and scary) lightening and thunder show. Odd. With this series, TiffanyDoodles is now offering pre-colored images. 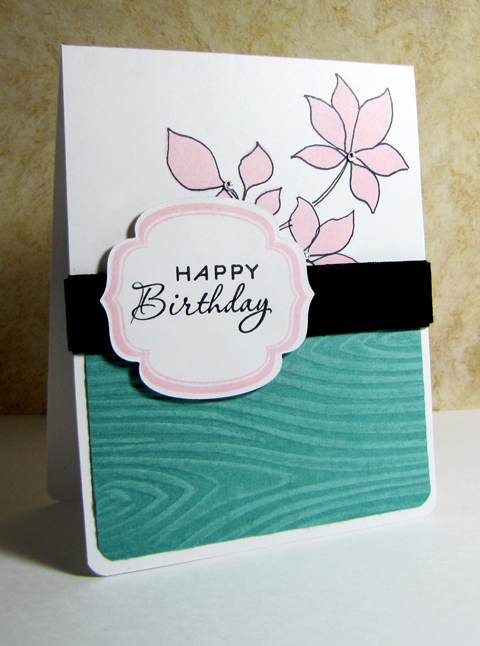 Making a card has never been more quick and easy....and pretty! Hope to be back after work to showcase a card! Petie went almost everywhere with my oldest when he was two. Petie went almost everywhere with my youngest when he was two. Petie was, er, is very well loved (and oh so dirty). I might have talked about Petie before on here, I can't quite remember. Petie is a doll that both my boys love(d). Wee Memories and The Lawnscaping Challenge have teamed up to showcase cute and cuddly creations. I started by adhering some soft baby yarn around a square block and topped it off with a pup that has a slightly distressed and well worn look to him. 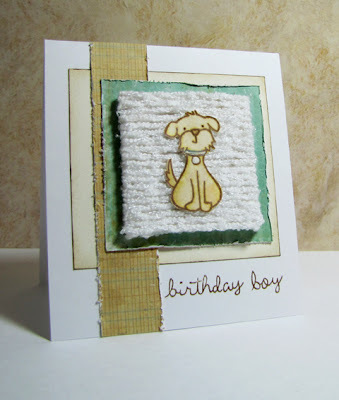 The square background reminds me of a chenille blanklie (as my boys affectionately call their blankets).The layout is from March's sketch at Artful Delight. I literally clench the wheel when driving on interstates or through big cities. Although I love what the city might have to offer, call me a country bumpkin any day and give me the speed limits of only 35-55 miles per hour. I think its been at least six months since I last drove through a city that has a real sky scape, and I'm totally fine with that. I was quite intrigued, however, to participate in Moxie Fab World's Cityscapes are on the Rise Challenge for the fact that cities represent growth. Growth represents change, as in a graduation, or a promotion-where the sky is literally the limit! St. Patrick's Day = Irish, Irish = Ireland, Ireland = History, History = Vintage Green Blooms. Some day my sisters and I are going to visit Ireland where we will take in all the culture, history and beauty. Some day. This bit o' green card was inspired by the St. Patrick's Day Waltz for Waltzingmouse Stamps. 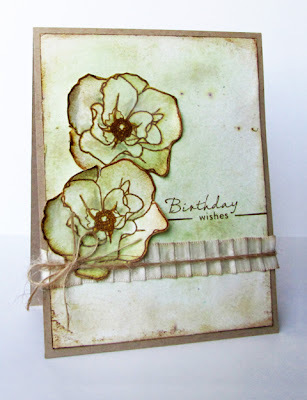 (I'm not one to give out cards for this holiday, nor to use a ton of green-just not my color, I guess-so I much more inspired by the history of the holiday...) I used a combination of distress inks and shimmer spray to create the vintage, old background. Most of the same techniques were incorporated into the blooms, from Roses in Bloom. 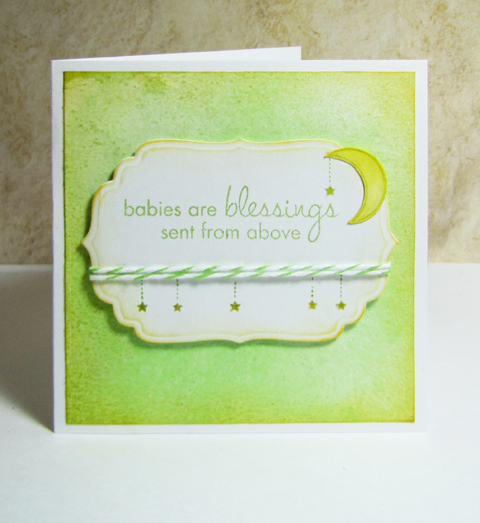 I added the delightful pleated ribbon, twine and a sentiment from Teeny Trees. 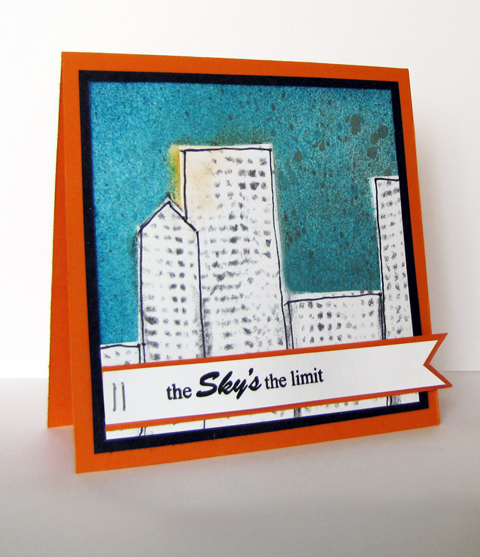 The sketch layout is from Limelight Papercrafts, where Mandy has the challenge to incorporate some green into the layout! When we were old enough, my oldest sister took my twin and I to the local thrift store. With a what seemed like a fortune in our pockets (but was really only pocket change) we entered the store with the confidence of rich women and started trying on the fine baubles and long dresses. Ahh, good times for sure. 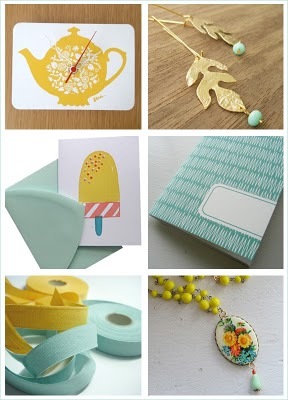 The beautiful and spring-like inspiration board at Jay Gee's Nook provided the color pallette for my card, and the sketch from Skipping Stones Design the layout. Welcome to my first ever Denami Design Blog Hop! 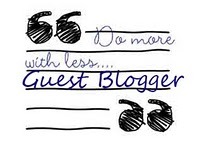 If you've arrived from the mega-talented Christina's blog, then you are on the right track! The cute little paper pieced elephant is on parade with his friends, but stands out from the rest as he lets his true colors shine and holds in his trunk a flower of thanks, just for you. The next stop is super sweet Tracey! There are a total of 30 floral frenzy stops along the way, so if you ever get lost, stop at Denami Design's blog for a complete list. 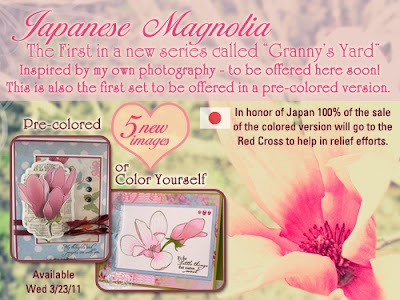 There is a chance to win a mini shopping spree at Denami Designs. 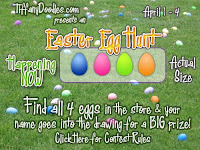 You have until March 14th to leave comments on all of the blogs to be eligable for a prize! 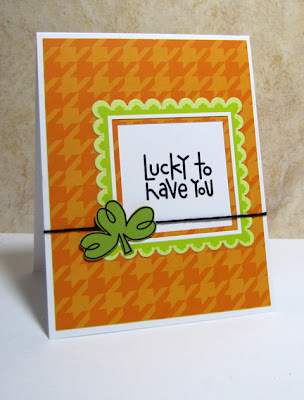 "Luck", in general terms, tends to be as good as it is bad. I'm fortunate that I have experienced both- to balance out my life. I was also awarded this from Brandi at Yankee Belle Stamper. Thanks, Brandi! 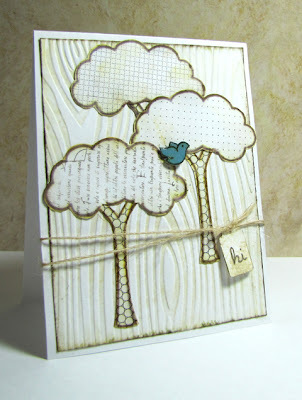 Brandi is so fun and talented...love what she does with PTI stamps. 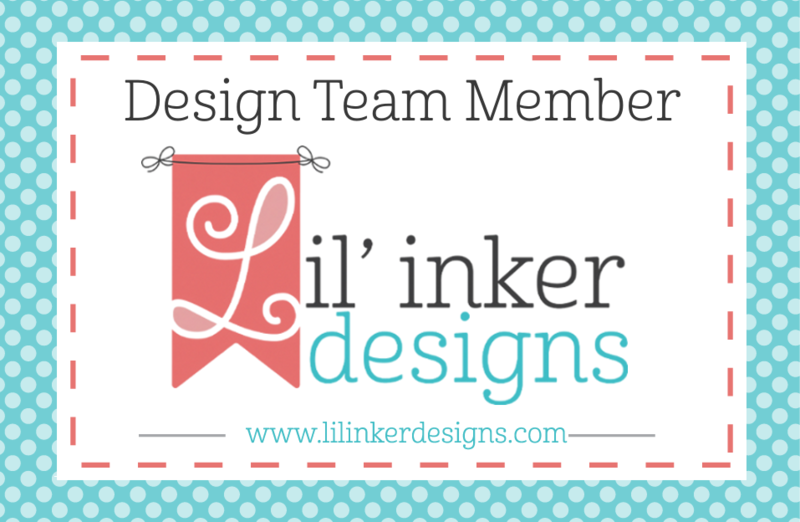 I'd like to give a shout out to a few other blogs that I've started to follow recently, these ladies are also so very talented! Him: Why are you making a cloud with words in it? Me: Because it isn't a cloud, it is a thought bubble. Me: A thought bubble. You know, sending you happy thoughts. Him: What? It looks like a cloud, and clouds don't talk. Nor are they happy. Me: Because it isn't a cloud, it's a thought bubble. Him: No, it's a cloud. Let me go ask the boys what they think it is. Him: Do you see this cloud with words in it? 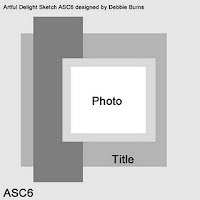 What does it look like to you? Him: You know what a cloud looks like right? All puffy and circular? 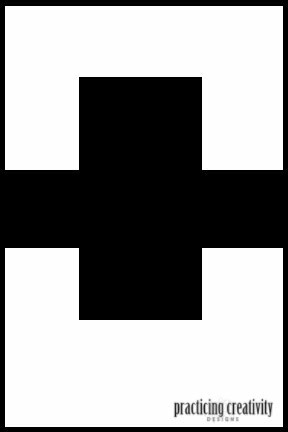 What does this look like? I'll hand it to him, this stamp could be a cloud which I will save making for a rainy day, but today it is a thought bubble and the card is sending some happy thoughts. The very clean and simple card is based off the current sketch at Denami Designs, and the thought bubble is one of their inventive stamps. A picture of a little handsome baby wrapped in white blankies greeted me Tuesday morning on my telephone. My nephew arrived! Hoorah! I'll let you in on a little secret...This set was created with his arrival in mind. Could there have been any better inspiration than a real little bundle? I made some sweet little baby sock cupcakes (the real ones with this much frosting wouldn't have lasted long enough for a photo in my house) and topped them with a toothpick sun. 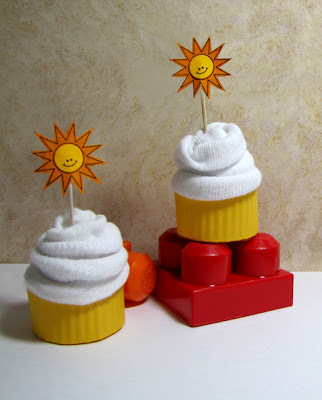 Bright and happy! 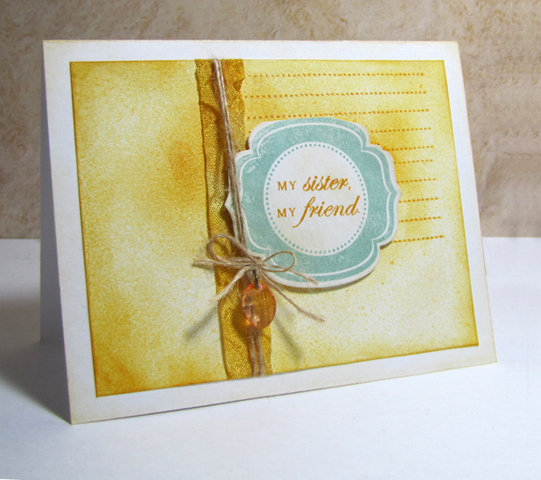 And I'll leave you, and my sister, with this card. 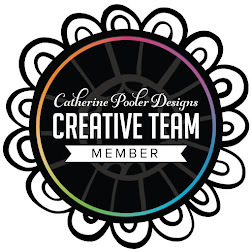 Please check out the other Practicing Creativity Design Team Members Blogs! Little Bundle is now available! The diapers. The crib. The onesies. The dirty diapers. The carseat. The diapers. The sleepers. The dirty diapers. The stroller. The diapers...Babies sure can fill your home up fast with stuff, but my oh my do they ever fill your life and heart with joy. Joy beyond belief, even through all the diapers. 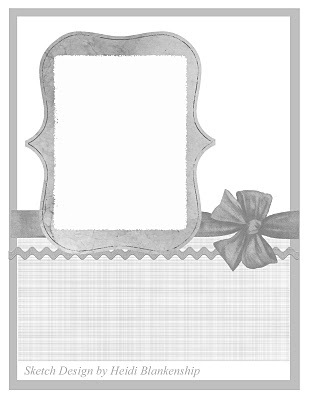 The newest release from Practicing Creativity Designs, Little Bundle, is the perfect gift giving and works so well with other PCD sets. 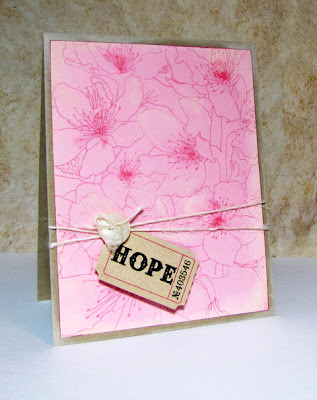 For this removable tag, I simply die cut and stamped (featuring the wood background from Carved Love) a piece of cardstock, distressed the edges and let the awesome sentiment from Little Bundle steal the show. 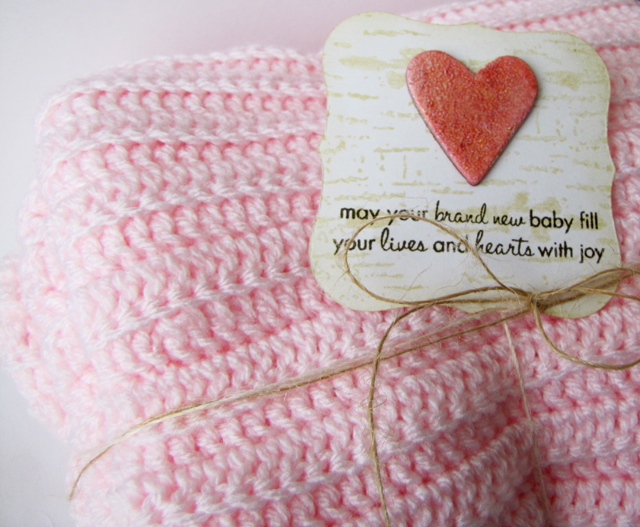 A glittered, glossy pink heart accents the sentiment. Valerie, Dana and Courtney have some truly fascinating ideas for baby gifts as well, please take a minute to check out their blogs! 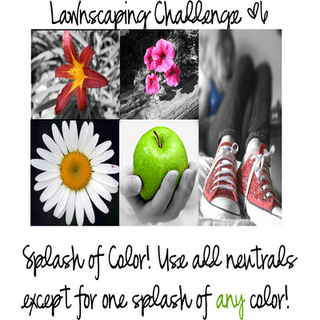 Also, there is still time to play with Practicing Creativity's Sketch Challenge too! This past Sunday, I listened to a rather lengthy sermon. Luckily, one little phrase caught my attention so his message stayed close to my heart: babies are the closest thing to heaven here on earth. Truly, babies are blessings sent from above. 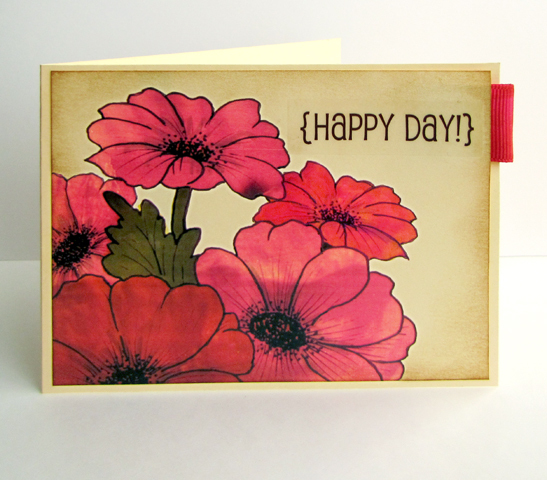 Welcome to the first day of Practicing Creativity Design's March Release! The design team was challenged to come up with a monochromatic card. 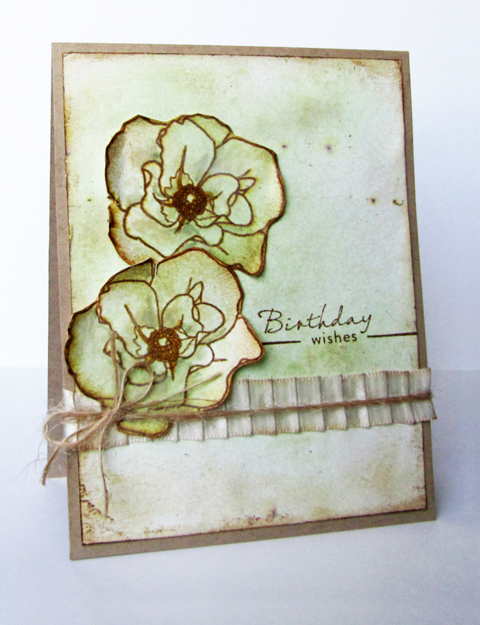 The background on my card was created by using a series of mists and table salt to create that dreamy feeling. 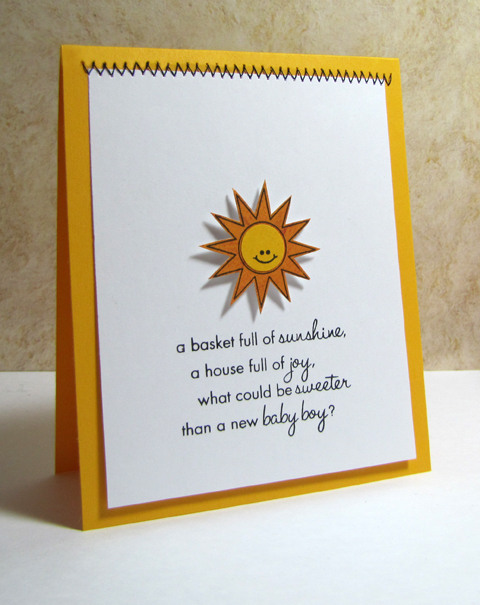 The sentiment rests on a die cut shape and the moon is paper pieced for dimension. Dana, Val and Courtney have some other fabulous monochromatic cards for the little ones in our lives to show you! Also, join in on the sketch challenge for a chance to win three Practicing Creativity Design stamp sets. 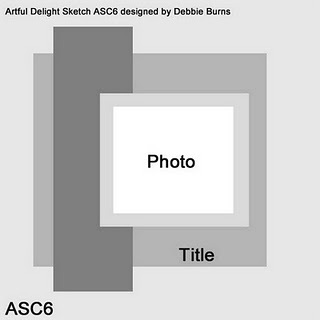 The sketch is wonderfully easy to work with, open for much interpretation. Thank you to everyone that signed on to follow during the Tiffany Doodles Spring Hop, I sure hope to not dissapoint you on return visits! And thanks for everyone that has continued to follow and leave such nice comments, you truly are why I am still here, blogging. The winner of this beautiful dogwood branch image from Tiffany Doodles, chosen by Random.org is Emily Leiphart, from Art from the Heart. Emily is one talented lady, please check out her blog! 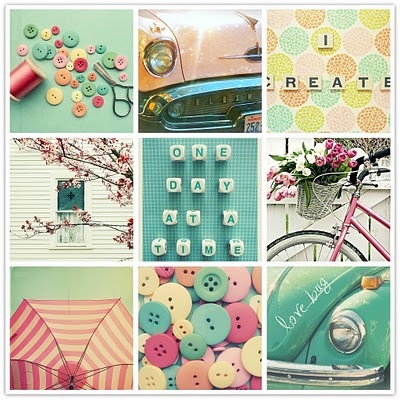 TiffanyDoodles Challenge this time around is a lovely photo inspiration! 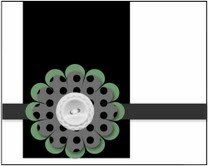 I started with a poppy image from the internet, made it really large in my photo editing program and basically superimposed this poppy image from TiffanyDoodles. 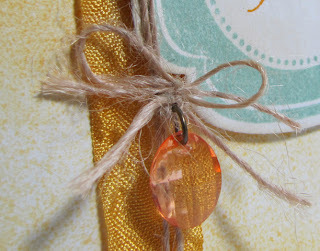 Find the rest of the details and link up your creation on Tiffany's blog! 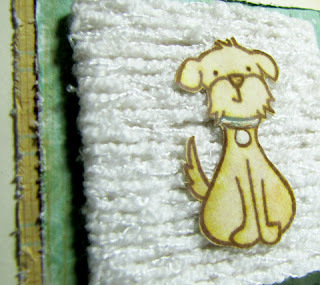 For my TiffanyDoodles Blog Hop post, please click here! Tapping feet. Clicking fingernails. Sighing...Waiting patiently. My dear baby nephew, I am patiently waiting for your mama to call me up and say she's going to the hospital. My dear baby nephew, I'm patiently waiting for your proud father to call and say how you and your mama are doing fine... I can't wait for you to arrive. In the meantime, I will continue to be inspired by your impending arrival. The colors were inspired by the challenge over at Off the Wall Craftiness. Loved that umbrella in the corner, which reminded me to pull out some decorative tape. 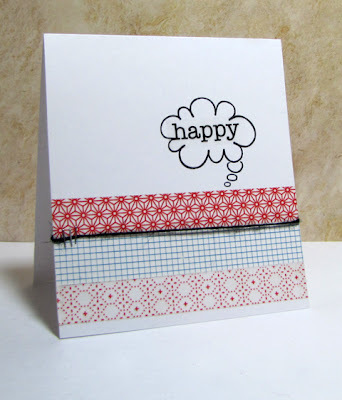 I lined the tape in rows for a unique and graphic pattern, which was oh so much more quick then cutting and gluing strips of paper. 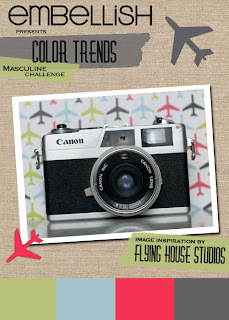 Thanks to Moxie Fab World and their challenge to Get Daring with Decorative Tape. 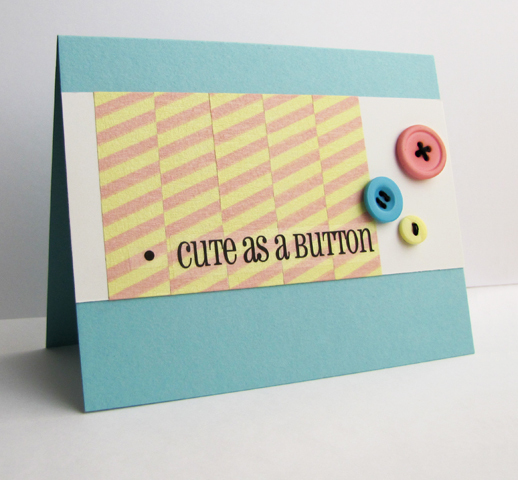 I cute-enized the card up with the sentiment and some buttons. Practicing Creativity Designs has something special up their sleeve for this month's release. 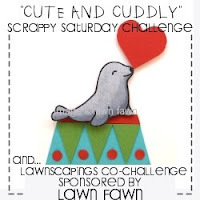 We start the festivities out with a sketch challenge! The colors in the photograph might appear a bit distorted for which I am sorry, this dang winter hasn't allowed me to photograph outside for a while now! A spring in your step, a springy blog hop! 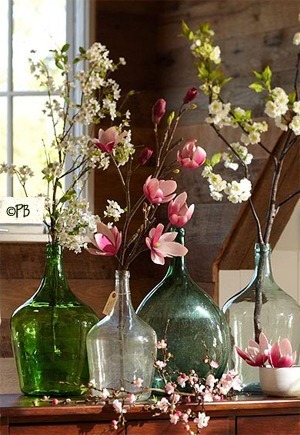 I miss the spring of where I used to live, I miss seeing the dogwoods bloom early. What I don't miss is the five or so expected inches of snow we are supposed to get where I live now. This card was so easy to create, I think I'll be trying it again. 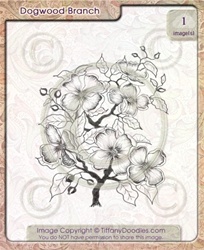 I printed the delicate dogwood branch image, misted and highlighted it, coloring the leaves with mist as well. 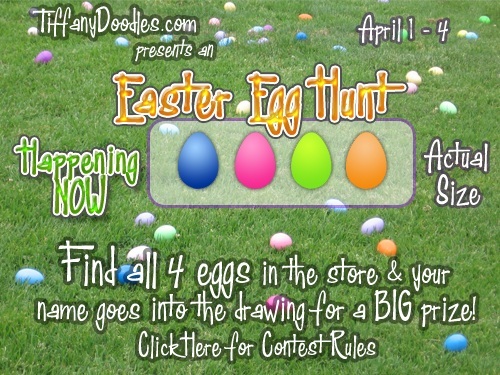 Today begins a 3 day blog hop at Tiffany Doodles where there are giveaways at every stop. 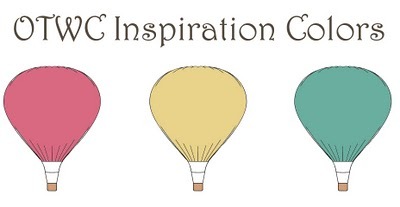 There are some amazing happenings (besides this fun hop) at Tiffany Doodles this month. The regular Card Challenge starts Monday, March 7th! 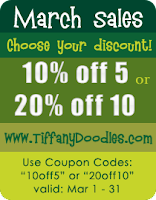 Tiffany also has great sales going on. Seriously. The Recycling Bins talk to me. You see, working in a print shop has benefits. Boundless papercrafting possibilities just lying there in vast, bottomless recycling bins, reaching out and saying "Use me, use me! Rescue me. Oh please!" Seriously. That is what this large remnant of glossy die cut paper said as I passed by the machine on the way to the envelope press. 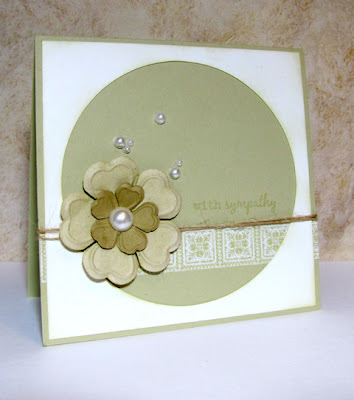 The large circle was perfect for today's Limelight Sketch Challenge and Product Challenge. One lucky winner will receive an Odd Bird Planet (justjohanna) stamp of their choice. Card entries must be linked to the Limelight post by next Monday afternoon before a winner is drawn! 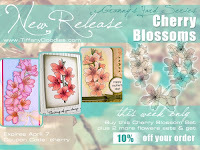 Stop by for links to the other fabulous cards from the design team, and remember, there are still so many great deals at the store! Stock up for the holidays and for every day!